Custom designed and engineered shipping container modifications can be built to be shipped to any remote location in the United States or around the world. Built to stand the test of time, shipping container modifications can be used as break rooms, offices, blast resistant tool cribs, modular chemical labs, and hazardous chemical storage. Given that shipping container modifications are portable and can be delivered from construction site to construction site, the solutions we build at DropBox Inc. are not a "one-time" solution. Our shipping container modifications serve their purpose at one location and can then be easily transported to the next location for easy installation and use. Our customers and our experienced team of shipping container modification specialists have helped us to build a wide range of products in a variety of climates and locations around the world. At DropBox Inc. we work with our customers to create custom modified shipping containers to provide the right solution to the site-specific challenge they’re facing. Regardless of whether they are storing equipment and tools and creating workspaces, or whether they need meeting/lunch space, rest assured that DropBox Inc. has the expertise to meet your needs. We have a long list of long-running relationships building products for industrial and commercial construction companies, as well as the military and government entities. 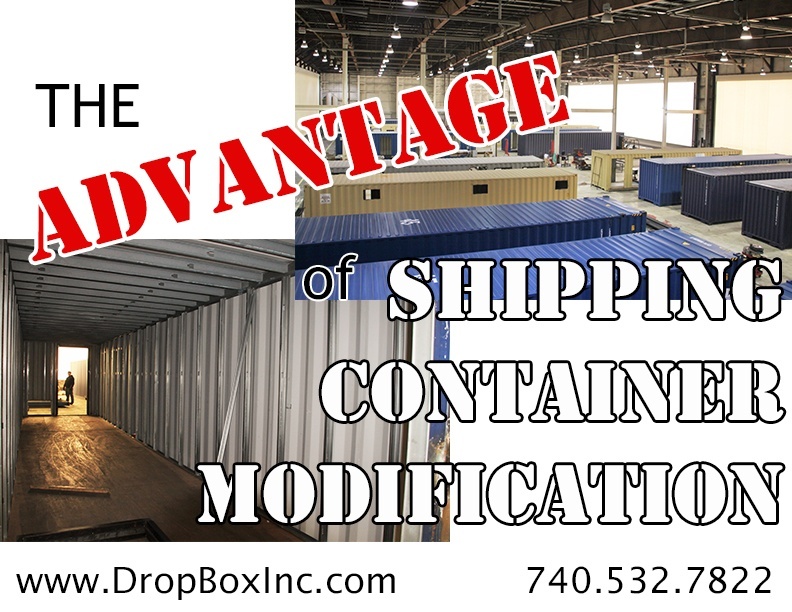 For more information on DropBox Inc. and all of our ISO shipping container modifications feel free to CONTACT US HERE or call us today at 740.532.7822. DropBox Inc. is an ISO shipping container modification business. 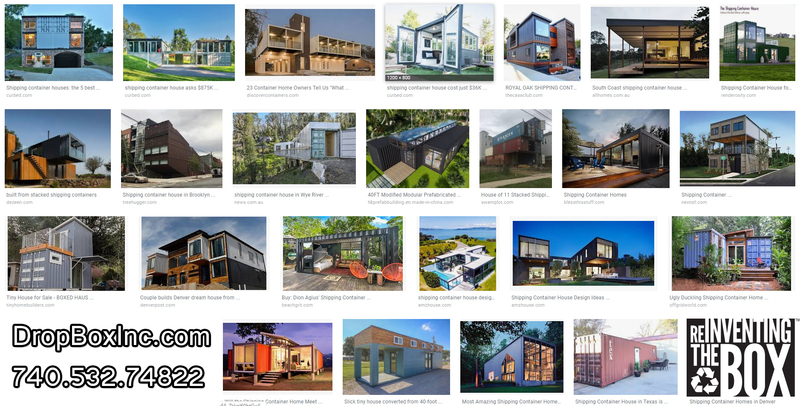 We work with shipping container brokers around the U.S. to procure one-trip shipping containers to build our products and promote green construction. We take shipping containers and re-invent them through modifications to create one-of-a-kind products, as well as a long line of standardized products like Blast Resistant Modules, Ground-Level Offices, Modular Chemical Labs, and much more. The re-use and recycling of shipping containers for the construction of portable jobsite solutions makes perfect sense for DropBox Inc. and our customers. All around the world shipping containers are used for imports and exports. Due primarily to the growing U.S. trade deficit with shipping container producing countries like China, roughly 7 million shipping containers come into the U.S. every year while only about 2.5 million are shipped back out. Because of this, shipping containers are being stockpiled at ports all around the country. Many of these containers go unused – and that’s where DropBox Inc. comes into play. We purchase these containers and use them to build our products. In doing so we are essentially recycling containers that would otherwise go unused and left sitting at ports and harbors. By building our shipping container products from one-trip containers, DropBox Inc. creates shipping container modifications that prove to be more durable and stronger than other comparable products that are typically built using conventional stick-built construction. 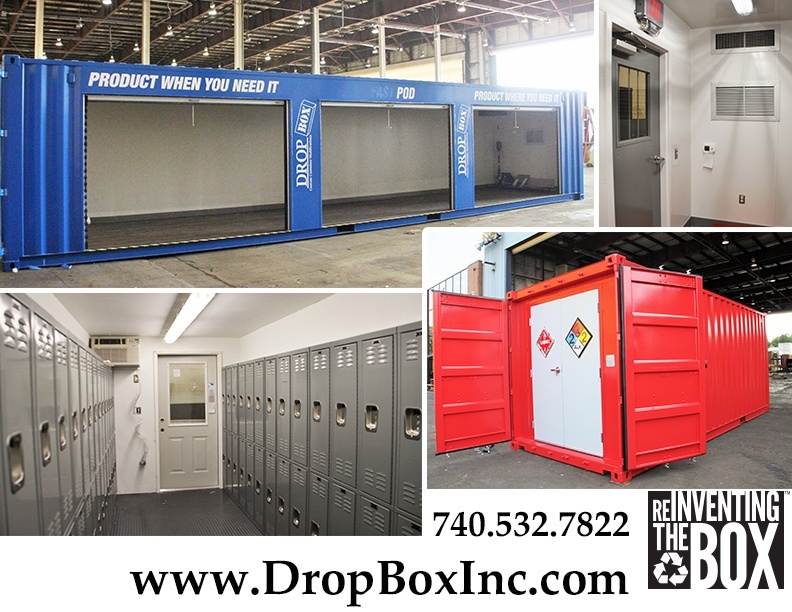 If you have an idea for a shipping container modification product and would like to learn how DropBox Inc. can help you bring your idea to life, CONTACT US or call 740.532.7822 to speak with one of our shipping container modification experts. A lot of fantastic things have been happening for DropBox Inc. and parent company Portable Solutions Group. 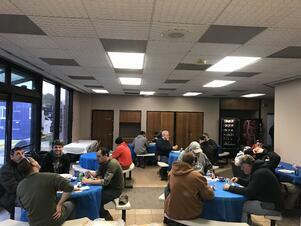 With major contracts awarded and work underway to meet the needs of our customers, we took time yesterday (at our Wurtland facility) and today (at our Worthington facility) to celebrate all of the hard work our employees and manufacturing team have put in to make things happen. Special thanks to the team from The Armory Smokehouse in Ironton, Ohio. 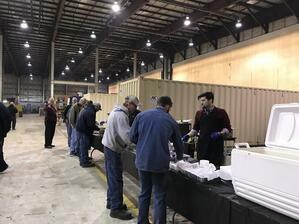 Bobby, Josh, Hershel, and Donnie from The Armory went out of their way to provide our workers with delicious food and excellent service. DropBox, Inc. has a longstanding relationship serving the Industrial, Military and Commercial markets with products that meet the customer’s needs. Dropbox Inc. has become the one-stop shop for project managers, procurement professionals and end users when it comes to furnishing their jobsites, plants, and man camps, with the best solutions to help make their projects run smoothly. DropBox, Inc. has roots planted firmly throughout industry with a proven track record for quality and customer service. Shipping Container Modifications for Ground Level Offices, Hunting Cabins, Houses & Beyond. The Possibilities are Endless. Whether your shipping container modification needs are large or small, for work or for home DropBox Inc. has the expertise and capabilities to meet them. Need something a little extra, just let our shipping container modification experts know. A custom shipping container container modification may be just what you need to house your employees or your family. We offer design, engineering, and manufacturing that is top notch regardless of your needs. DropBox Inc. has been building a fine line of standard shipping container modification solutions for industrial and commercial construction companies around the year for more than a decade. Shipping container modifications that are engineered and designed to meet construction needs are just one of the many custom options we offer to our customers. Many of our products have been located in the U.S., Canada, and around the world. If you need a containerized lab, ground level office, hazardous chemical storage or a portable work space we have the expertise to take your needs and turn a shipping container into the product you need. Our customer and our experience in the industry have helped us to build a wide range of products. We like to work with our customers to create custom modified shipping containers to provide the right solution to the site specific challenge they’re facing. Regardless of whether they are storing equipment, tools, and creating workspaces or need meeting/lunch space rest assured that DropBox Inc. has the expertise to meet your needs. When it comes to developing shipping container modifications the possibilities are endless. If you have a shipping container modification idea, need, or simply a want, do not hesitate to CONTACT US or call 740.532.7822 to speak with someone on our team. 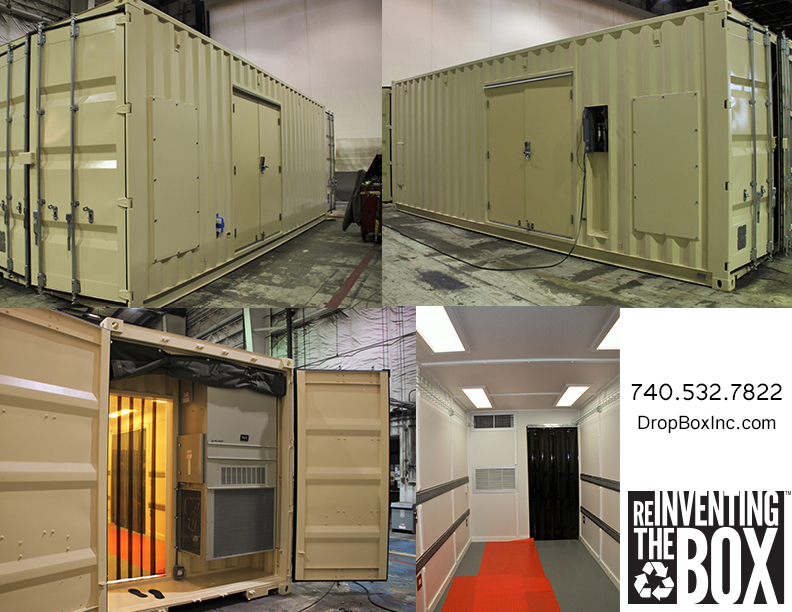 DropBox Inc. offers custom shipping container modifications that are exceptionally designed and engineered to meet our customers’ site-specific needs. Because of the steel building block that is an ISO shipping container, we begin with the perfect building block for turn-key, portable solutions for a wide range of products. Shipping containers are built to withstand the harsh conditions of ocean travel and are suitable for every environment on the planet. DropBox Inc. can take the standard shipping container and modify it into almost anything imaginable. While typical shipping containers have doors that open on one end we are not restricted in the addition of multiple entry points for our container modifications. The other three sides of the container and even the top of the box are solid corrugated steel that can be modified to meet your site-specific needs. In order to provide additional structural integrity, we reinforce our modifications to meet modular building codes. When designing and engineering our shipping container modifications we take great care in consideration of the final use of the product. We offer: Quality Craftsmanship – DropBox Inc. performs all our modifications and repairs at one of our manufacturing facilities in Worthington and Wurtland Kentucky. Our modifications are performed according to the highest standards to ensure that your container modification product will endure years of use. We provide simple and complex modifications. By installing man-doors, or roll-up doors we can make accessing contents in a container more convenient and easy. More complex or extensive modifications and additions can transform the container into any number of high-end commercial or industrial construction products. 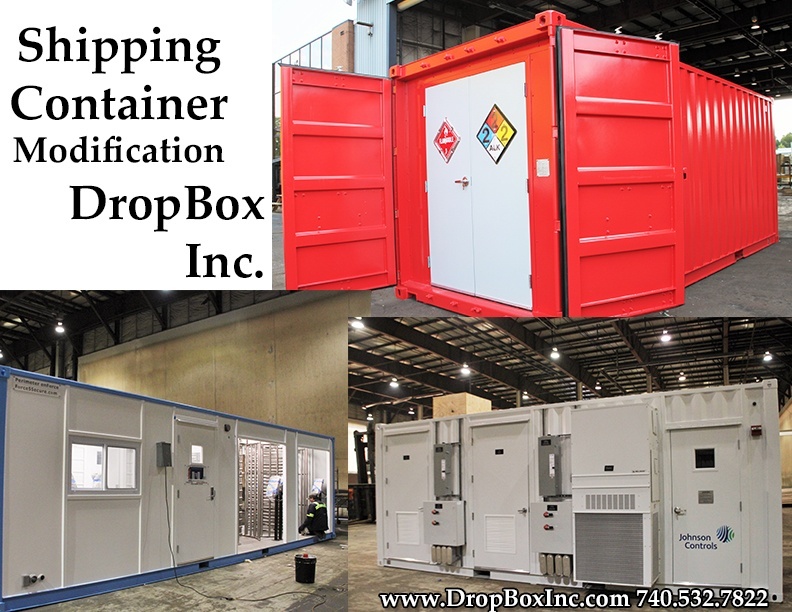 When you work with DropBox Inc. the modification of shipping containers and delivery of a turn-key product is completed prior to being delivered to your site. Because of this, very little onsite preparation is needed. Simply sit in place and connect the unit to power and you are up and running. By delivering pre-engineered and designed units, DropBox Inc. expedites the building process prior to delivery, saving you significant amounts of time and money. Take a look around our website and see some of the projects we've completed for other customers. At DropBox Inc. the experience and quality of service that come standard with our custom storage container modifications rank with the best in the world. Our team of shipping container modification specialists look forward to providing you the expertise in design, engineering, and manufacturing that your project demands. We are the experts in our industry, specializing in shipping container modifications from start to finish, regardless of the specifics of your needs. Over the years we have designed, engineered, and built shipping container modifications for ground-level offices, self-contained running water restrooms, modular chem labs, hazardous chemical storage, Blast Resistant Modules, and more. When it comes to shipping container modifications from DropBox Inc. the possibilities are endless. We are committed to bringing you the quality and customer service you need. 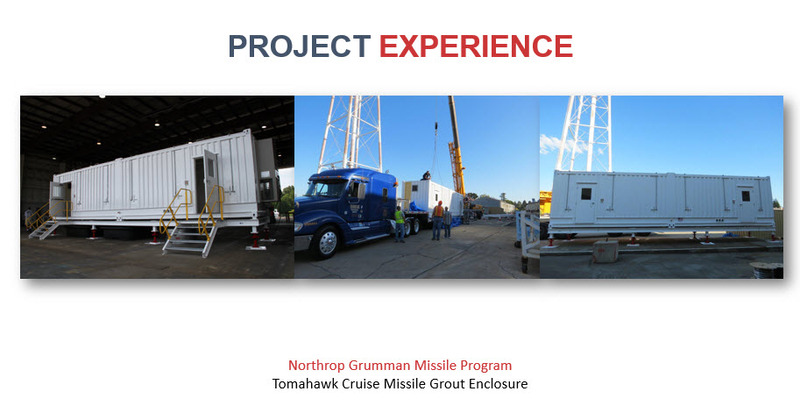 Whether you want a Blast Resistant Module, a containerized battery/inverter storage solution, ground-level office, running water restroom, hazardous chemical storage, or a modular chem lab we have the expertise and can build it for you! At DropBox Inc. we are not just building things out of shipping containers, we're ReInventing the Box. To download a product brochure of DropBox Inc. products CLICK HERE and CONTACT US with any questions. 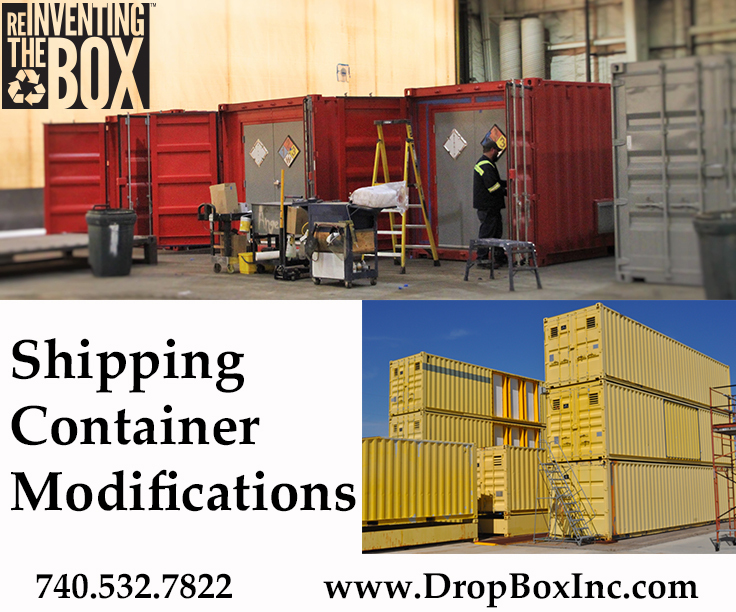 Shipping Container Modifications and More from DropBox Inc.
At DropBox Inc. we take great pride in making sure that we provide a safe, well designed, and perfectly engineered line of shipping container modification products. Working with our customers we coordinate every step of the process from inception to completion and on to delivery. Developing a strong relationship with a wide range of vendors over the years has allowed us to build and deliver our shipping container modifications on time, and at a competitive price compared to other shipping container modification companies. The standard ISO shipping container has been perfectly designed for the transport of cargo and is the perfect building block for a wide range of portable solutions. DropBox Inc. can manufacture any custom shipping container modification. Whether you need man doors, roll up doors, vents, windows, insulation, HVAC, electric, paint, and/or exterior facades, look no further than DropBoxInc.com. At DropBox Inc. we take the needs of our customers and create solutions custom designed and engineered to be the solution for their problems. DropBox, Inc. has a longstanding relationship serving the industrial, military and commercial markets with products that meet the customer’s needs. 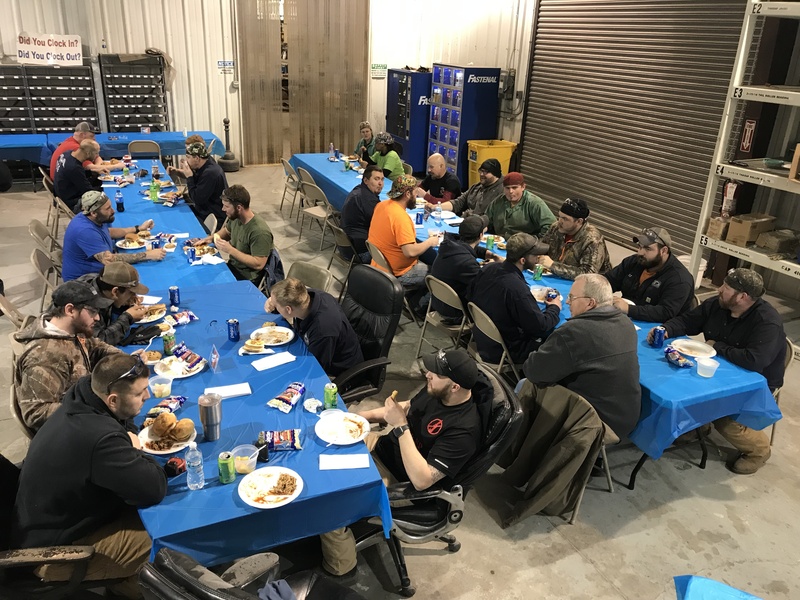 We have become the go-to, one-stop shop for project managers, procurement professionals and end users when it comes to furnishing their jobsites, plants, and man camps, with the best solutions to help make their projects run smoothly. 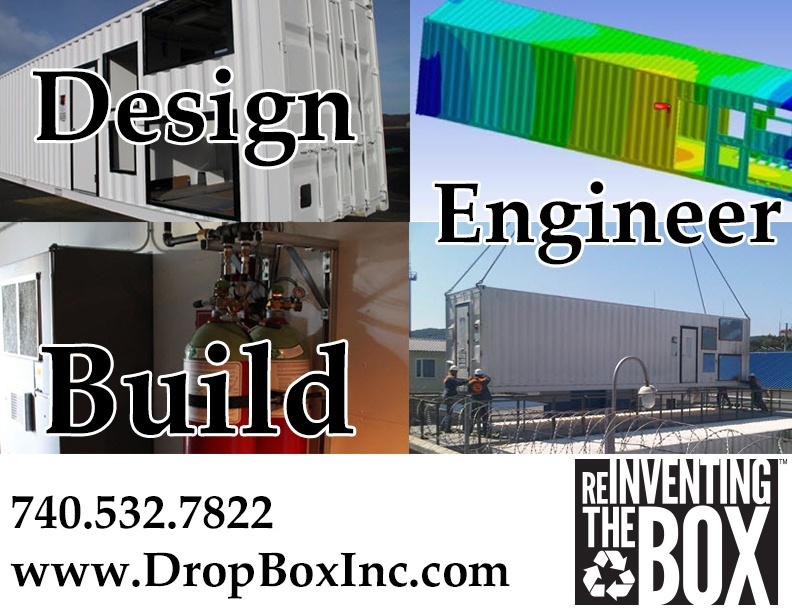 DropBox, Inc. has roots in the industrial and commercial construction industry with a proven track record for quality, turn-key, portable shipping container modification solutions, and outstanding customer service. DropBox Inc. Design, Engineer, and Build Shipping Container Modifications. Over the past few years trends in shipping container modification have pushed for new and improved building methods. Shipping container design, engineering, and manufacturing professionals on major industrial and commercial construction sites have found the the reuse of boxes becoming more and more advantageous. Through the use of engineering and design there are a wide range of temporary and permanent structures that can be built out of shipping containers. The durability of a shipping container makes it the perfect building block. You might already know, but shipping containers are designed to last for decades and live a long life at sea for import/export purposes. Unfortunately, most end up taking a one-way trip to their destination and then end up stored in container yards at ports around the world. Given massive trade deficits in many countries, it can actually cost more to have the container shipped back as opposed to storing it and building a new one. This deficit is the main factor contributing to the quantity of unused containers that are available for shipping container modifications. The structural integrity of shipping containers is unmatched when it comes to modular construction. Shipping container modifications are built to be very sturdy and easily transported via ship, truck, and rail. A steel frame is welded together and wrapped with corrugated corten steel as the walls and ceiling. Complete with marine grade wood flooring, containers are designed for the corners to bear all loads, which allows them to be very strong, easily shipped, and have the ability to be stacked up to 10 high. Professionals in industrial and commercial construction projects with experience working with shipping container modifications understand that container structures, if designed and constructed properly, are very safe, strong, and can be used for a variety of applications. Shipping container modifications have been used all over the world for industrial and commercial projects, the military, and companies in a wide range of industries. 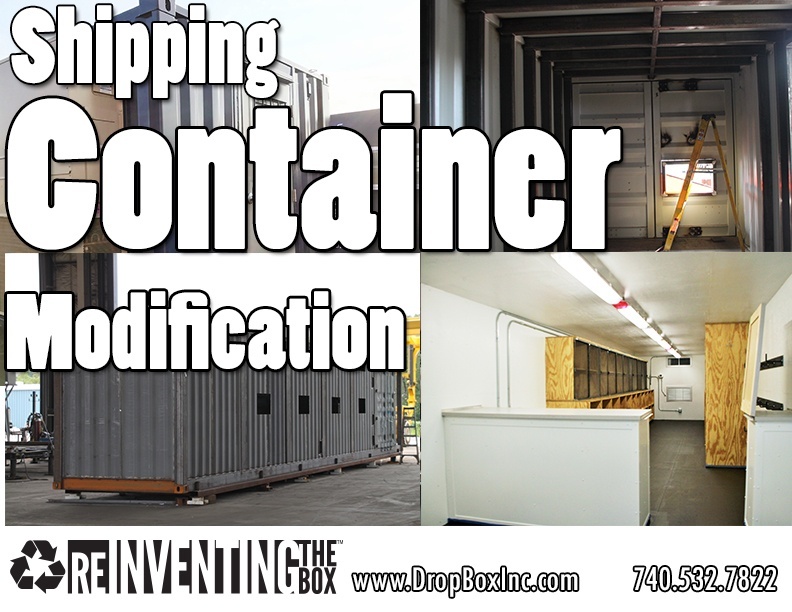 To learn more about shipping container modifications from DropBox Inc. CONTACT US HERE. The Advantage of Shipping Container Modifications from DropBox Inc.
Customers who know and use ISO shipping container modifications for portable, turn-key jobsite solutions in industrial and commercial construction are familiar with the many advantages of the products. When it comes to utilizing the portability, endurance, and longevity of shipping containers as a building block for a wide variety of products, DropBox Inc. is in a league of its own. In this week’s edition of the Shipping Container Mods Blog, we'd like to take a look at some of the advantages of using shipping container modifications for a wide range of products in the industrial and commercial construction industries. The most obvious benefit of using ISO shipping container modifications on an industrial or commercial jobsite is that they can be used with little-to-no modification as storage units that can quickly and easily be delivered to your construction project. These steel containers offer the perfect space to store tools and equipment throughout the duration of a construction project. They provide a significant amount of space for a wide range of items for as long as you need, are great if you need to keep anything safe from theft or vandalism overnight, and during down times and can easily be delivered quickly to your jobsite. Another great advantage of using quality shipping container modifications is the security aspect that they provide. It's a steel box! You can have your shipping container modification installed with a number of doors and windows (or no doors and windows outside those standard on the box itself) to ensure that all your valuable items are protected regardless of the jobsite they are on. Regardless of the weather outside or the geographic location of your industrial or commercial jobsite, DropBox Inc. has the shipping container modification with the durability to meet your needs. Restrooms, ground-level offices, chemical storage, labs, and more... No matter how brutal weather conditions might be, or if any outside damage occurs to your shipping container modification it will remain the thing it was meant to be. As long as these our shipping container modifciations are taken care of with regular maintenance, they will last for decades. Moving your shipping container modification from one jobsite to the next is a cinch. Built from the perfect building block, that is an ISO shipping container, our modifications have forklift pockets, and corner castings that make them easily loaded and unloaded from one jobsite to the next. Designed and standardized for shipping on trucks, trains, trailers, or boat, the shipping container modifications we deliver can be transported with the equipment already available on most industrial or commercial jobsites. Is it time for you to learn more about the advantages of shipping container modifications? If so, CONTACT DROPBOX INC HERE or call us now at 740.532.7822. "Helping the construction service industry meet competition with versatility."